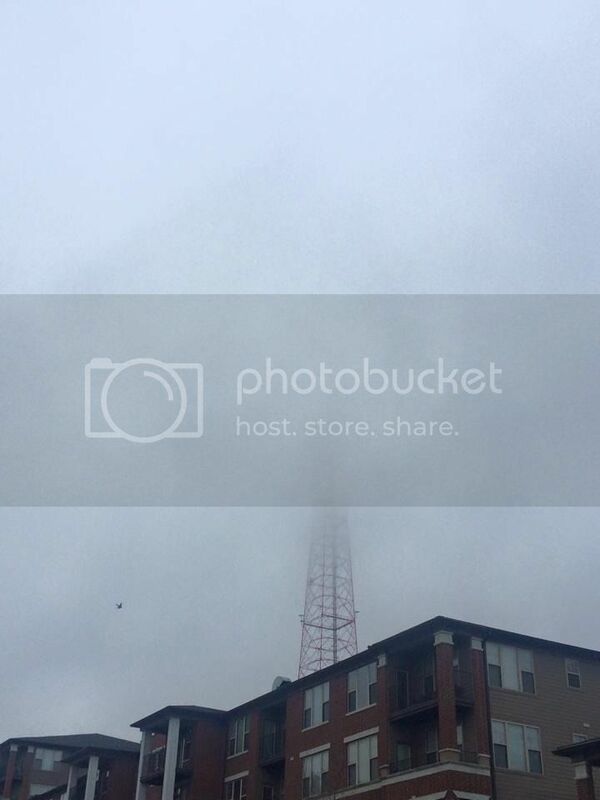 Alice has sent more snaps from her favourite spot overlooking I-670. 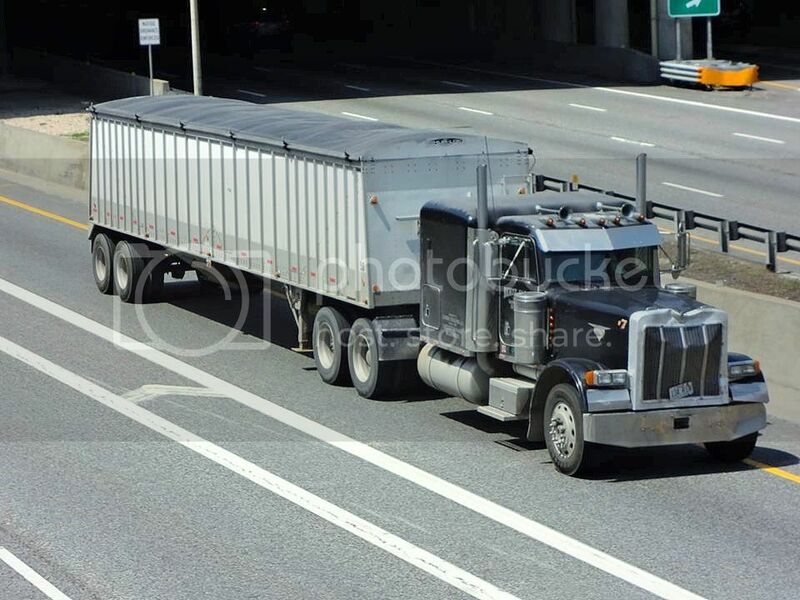 T model Kenworth (with Great Dane trailer) is unusual for North America in not having a vertical exhaust stack. 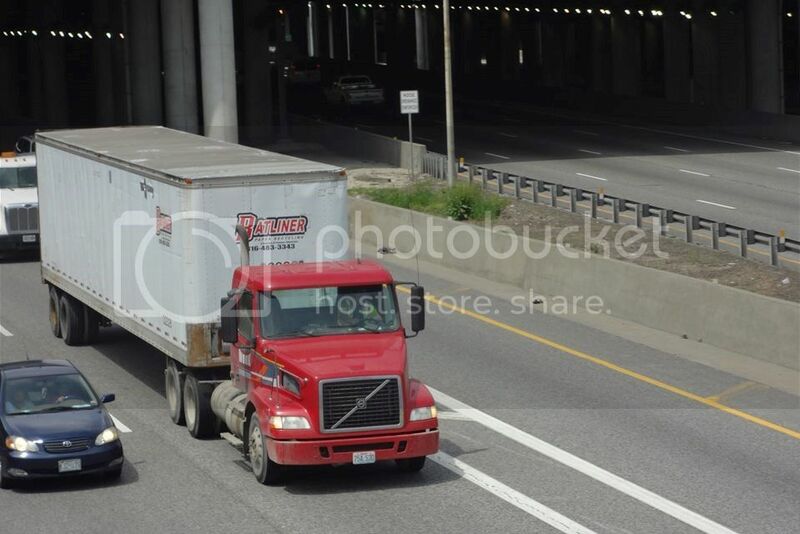 Sterling is on its way to pick up another container. 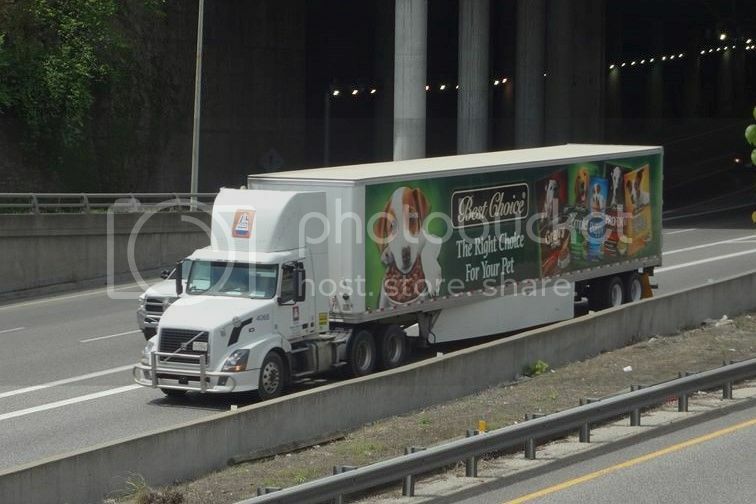 Day cab Volvo VNL loaded with 53' of pet food. There's a W900 underneath all those Ford Mondeos. Another 53 footer, this time pulled by an International Prostar of Knight Transportation. 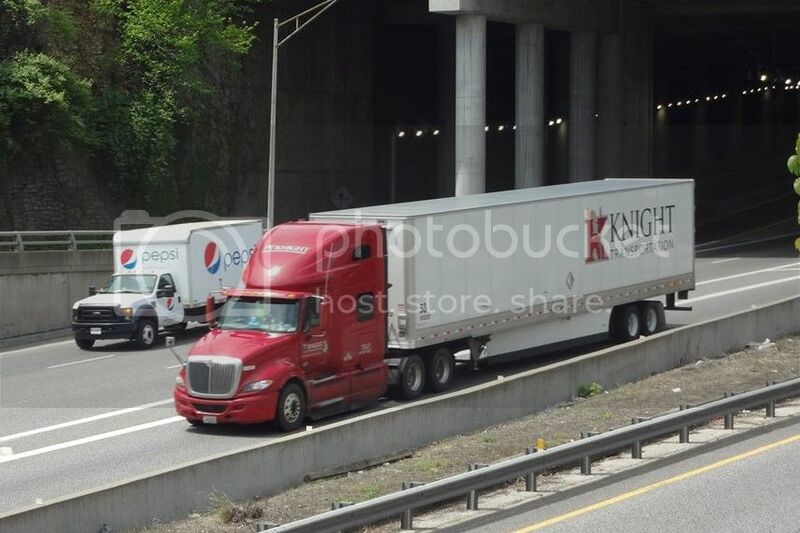 Knight Transportation has more than 4000 trucks and in excess of 8800 trailers in its fleet. Peterbilt 389 with vision limiting sun visor. 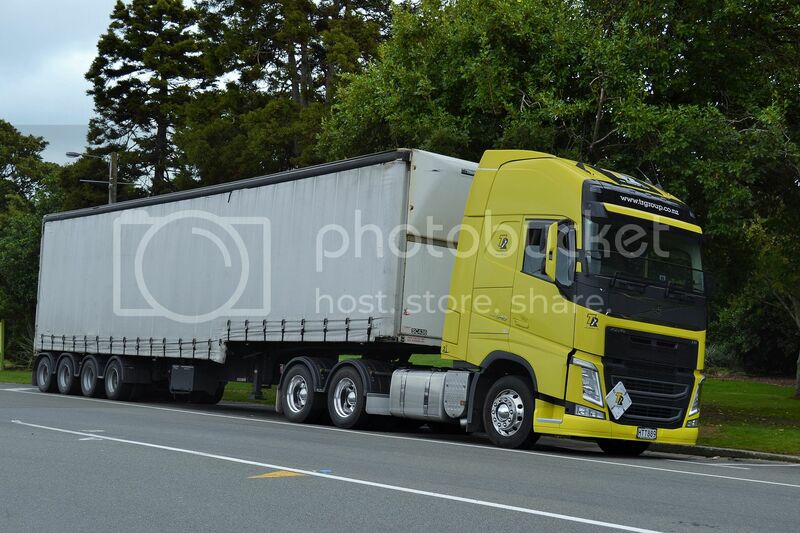 Another Volvo day cab, but a VNM this time. 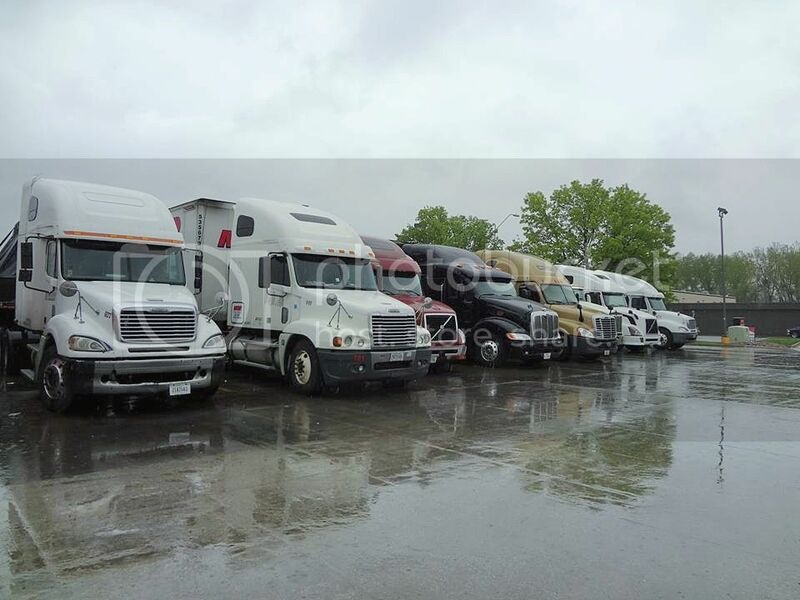 This unit it is operated by Kansas City based Batliner, who providing an extensive recycling service in the KC metropolitan area. 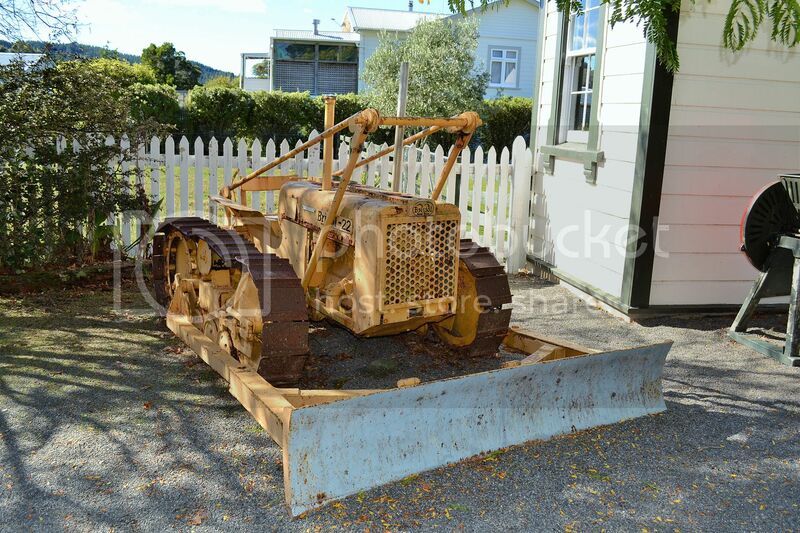 After attending the ANZAC service at Tinui today, I wandered around the village and snapped these. 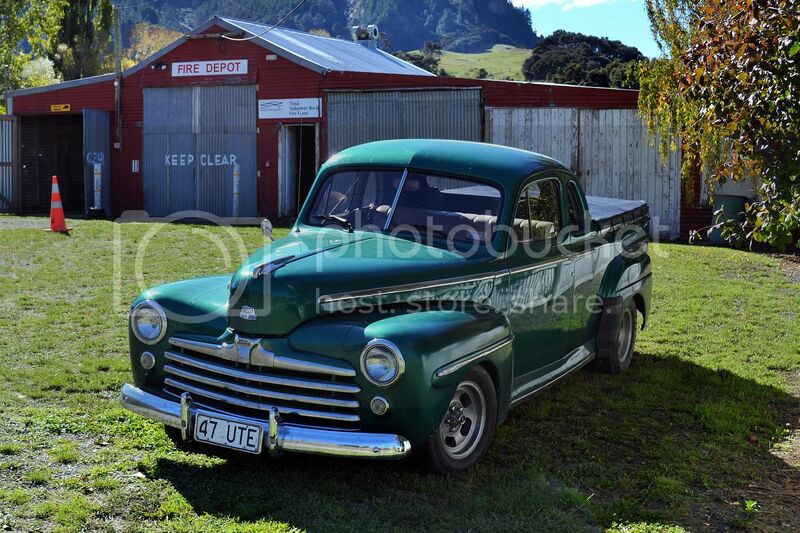 '47 Ford Ute is very smart, even with its non standard wheels. 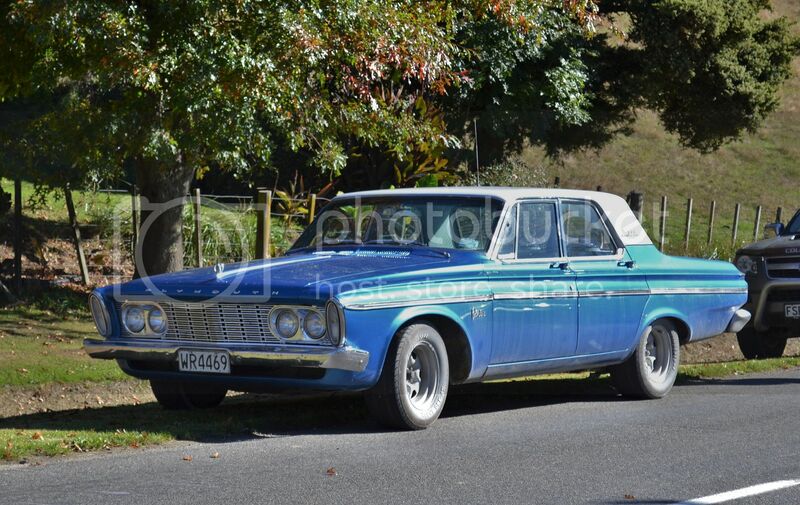 Not many 1963 Plymouth Belvederes around these days. The Bristol 22 was built in Britain in the 1950s. 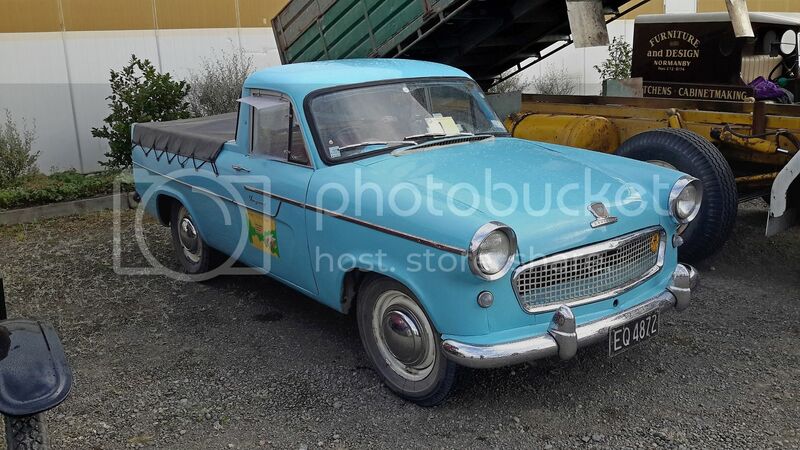 Bristols were imported into NZ in quite significant numbers, but this is the first time I can recall ever seeing one. 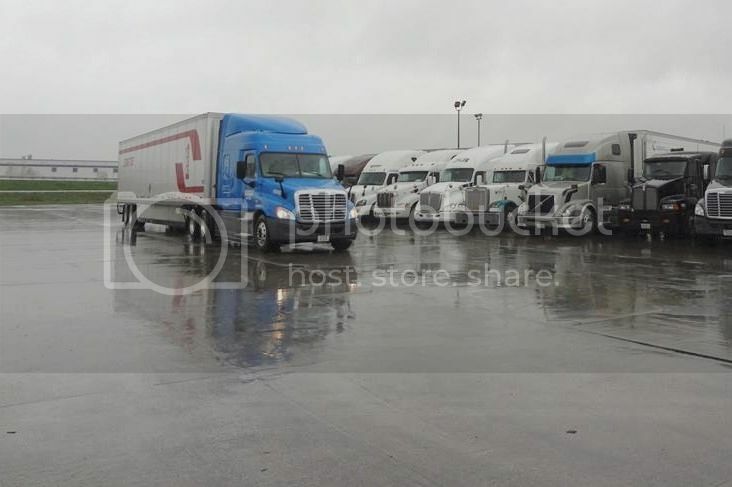 Some more pics from Alice's few minutes at the Flying J in KC,MO. 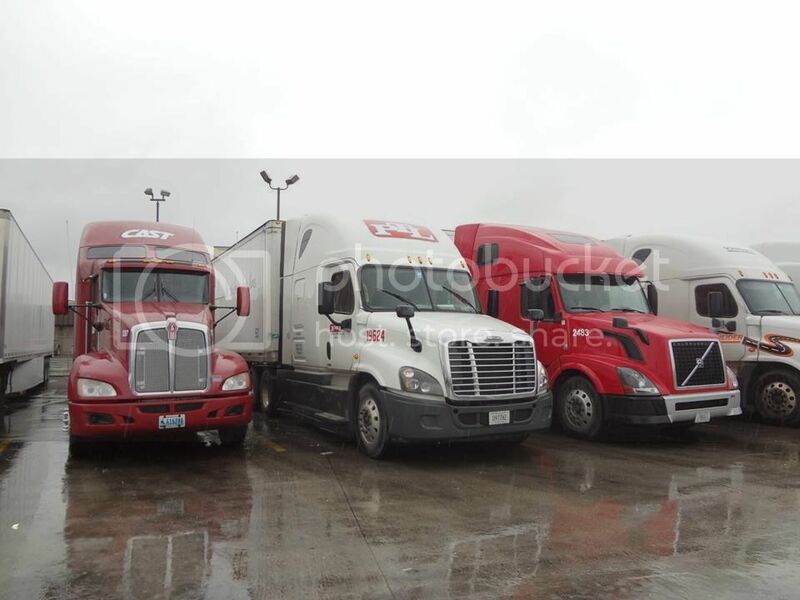 The nearest Kenworth might have a drooped nose, like the others, but the two piece windscreen shows its age. The wide angle mirrors on stalks seem common. Haven't seen them on NZ trucks yet. 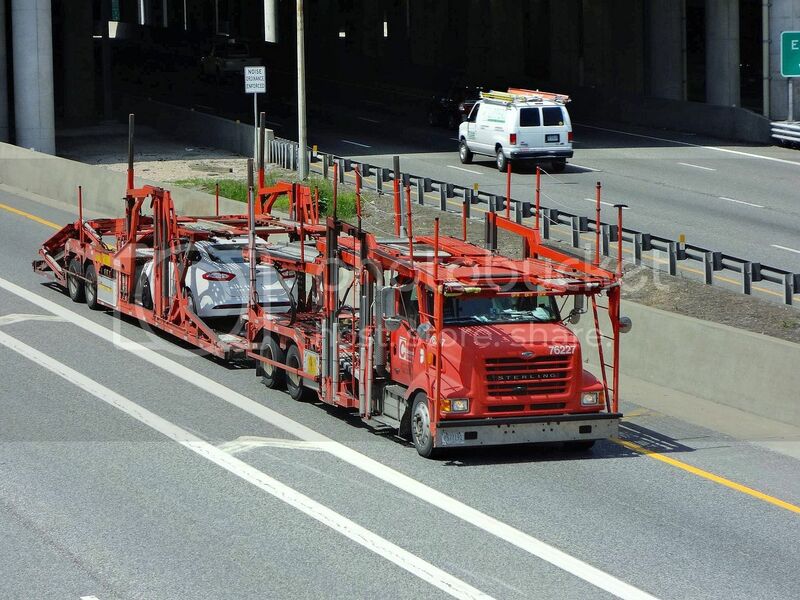 I would have liked a closer pic of the Kenworth car carrier in the background. 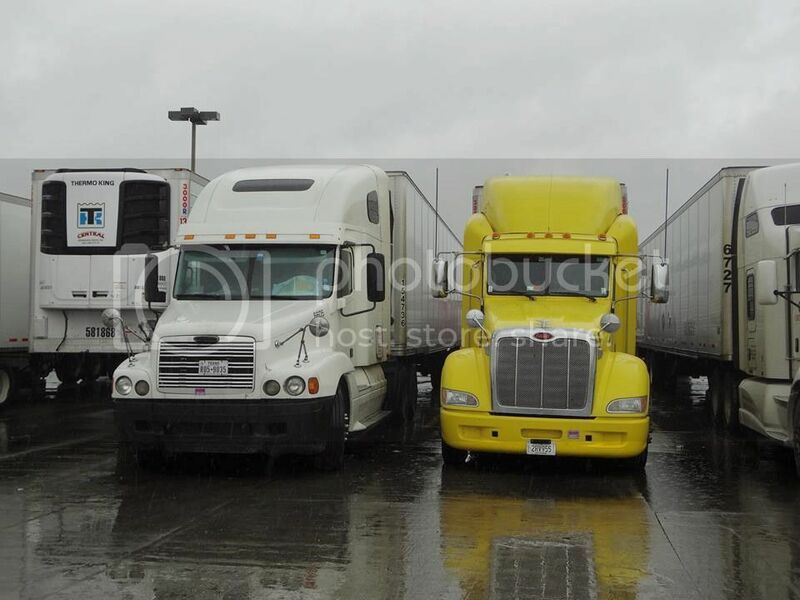 There's that yellow Pete again, sharing space with a Freightliner Century with a couple of grill bars missing. 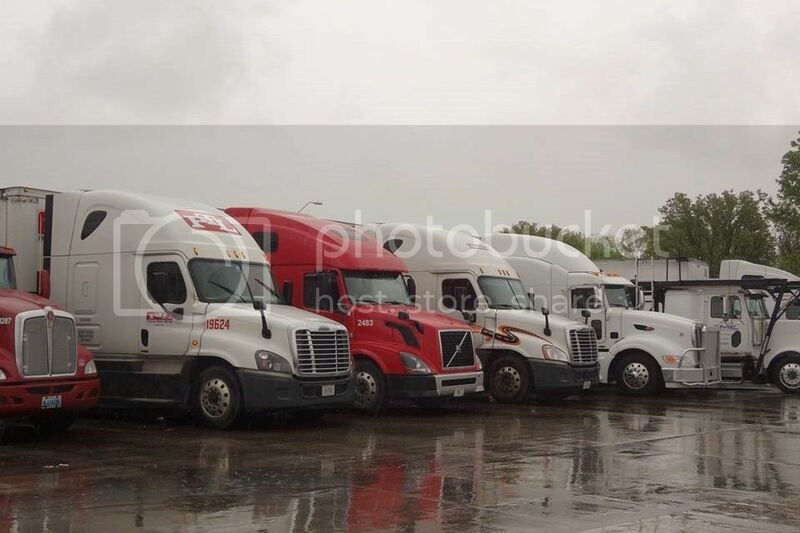 Still quite a few of the older Freightliners doing daily service. 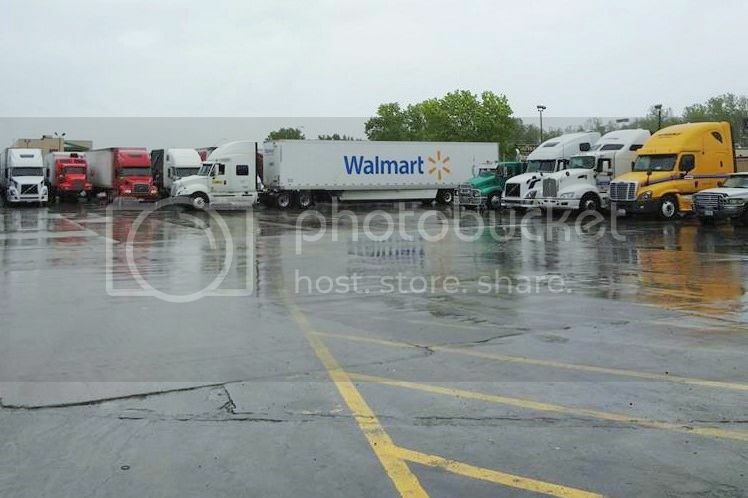 Walmart Freightliner heads out. 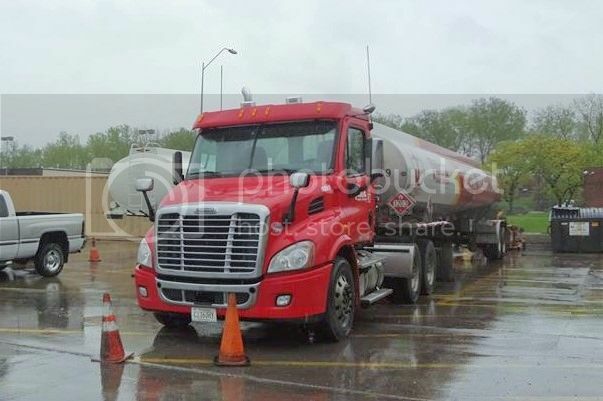 Yellow Freightliner is a Penske Truck rentals rig. 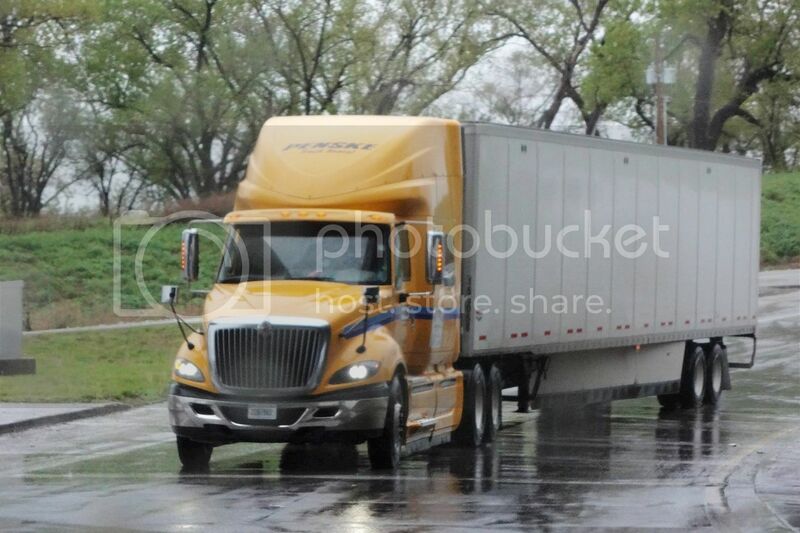 A Penske International on the slippery road. There's a notable absence of Macks. I'm guessing they are mostly employed in the construction and service industry. 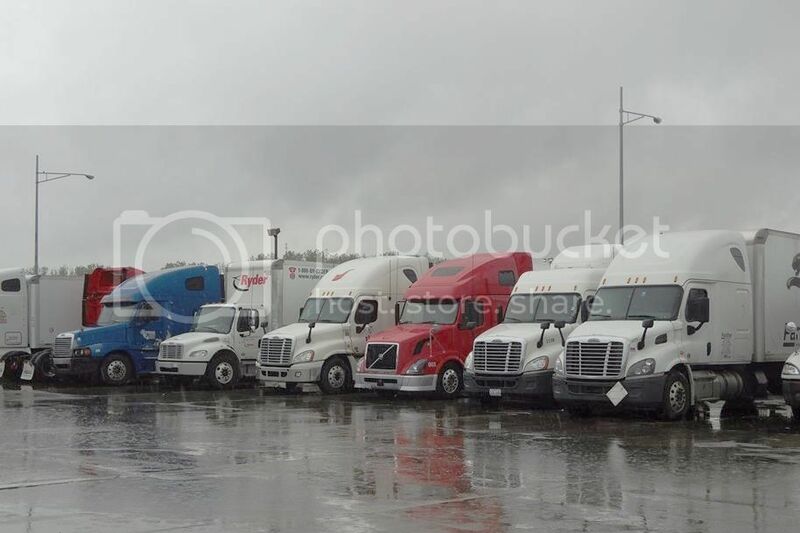 Alice spent 2 minutes in the pouring rain (and thunder and lightning) at the Flying J in Kansas City, Missouri to get these shots. 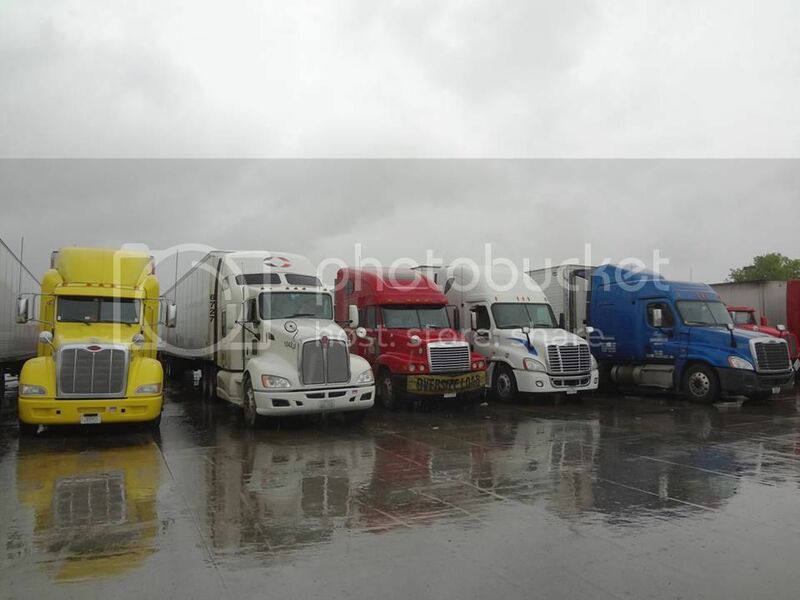 Yellow Peterbilt stands out in these conditions. 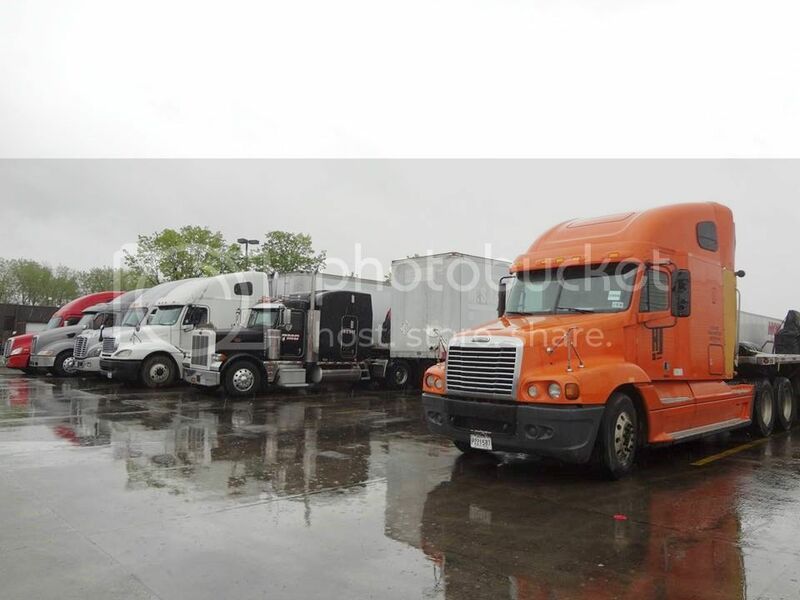 Freightliners are numerous in this area. 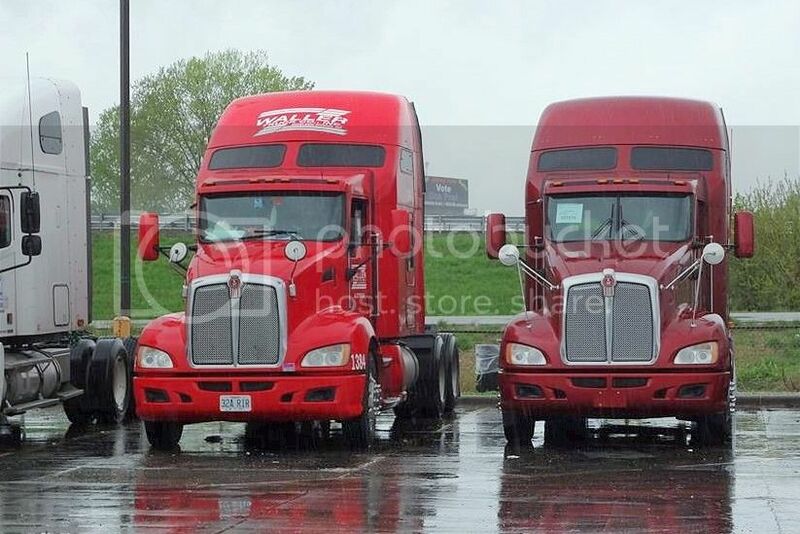 I still like the bold front of the Kenworth W900. Not so sure about the "snow clearing" bumper though. 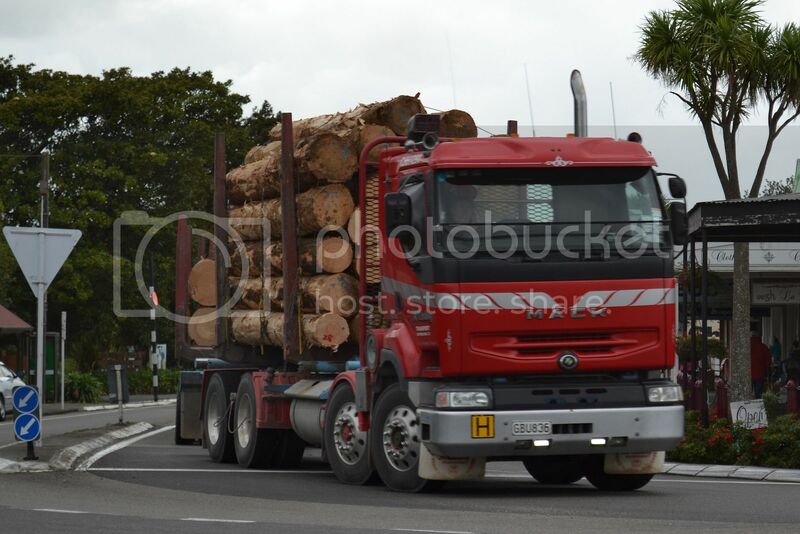 The lack of a rego and the paper work attached to the windscreen, suggests that the right hand KW is on delivery. No, it's not a black & white photo. 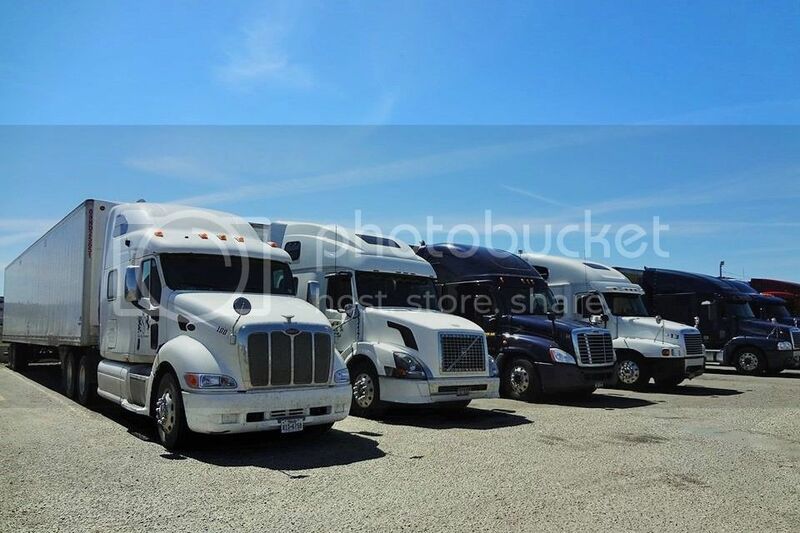 Lone Volvo, mixing with the Freightliners. 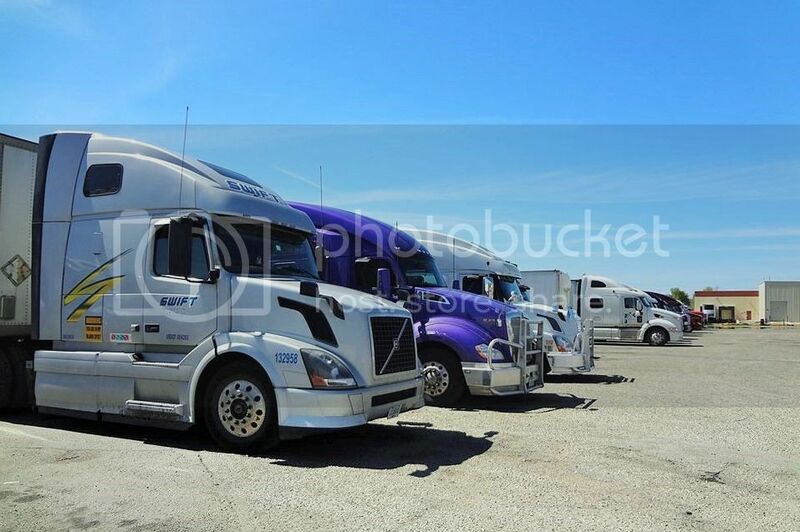 More Freightliners mixed with Volvos and Peterbilts. 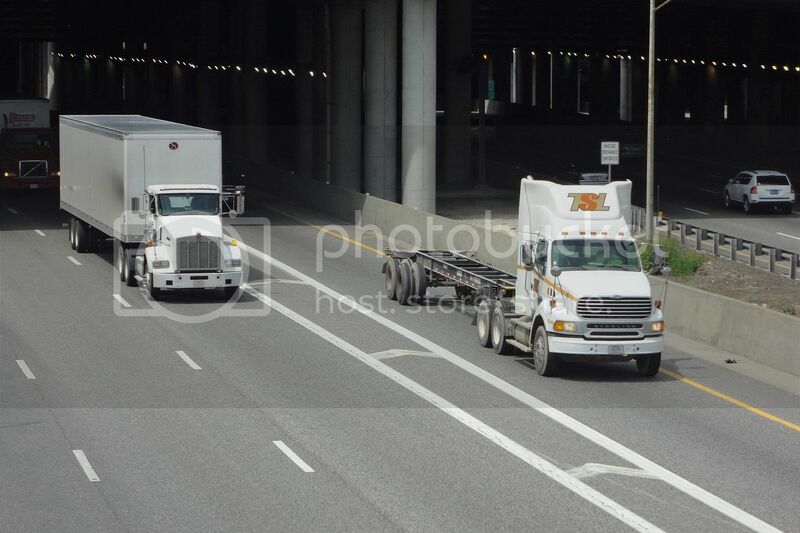 Notice how the trailer skirts taper at the front. I stood outside and snapped the passing traffic. 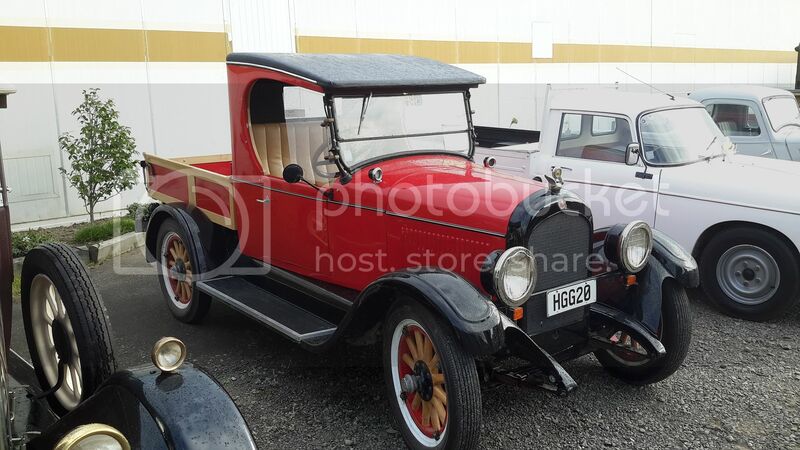 Ford Model A Coupe was travelling in convoy with a Fordor of exactly the same colours. 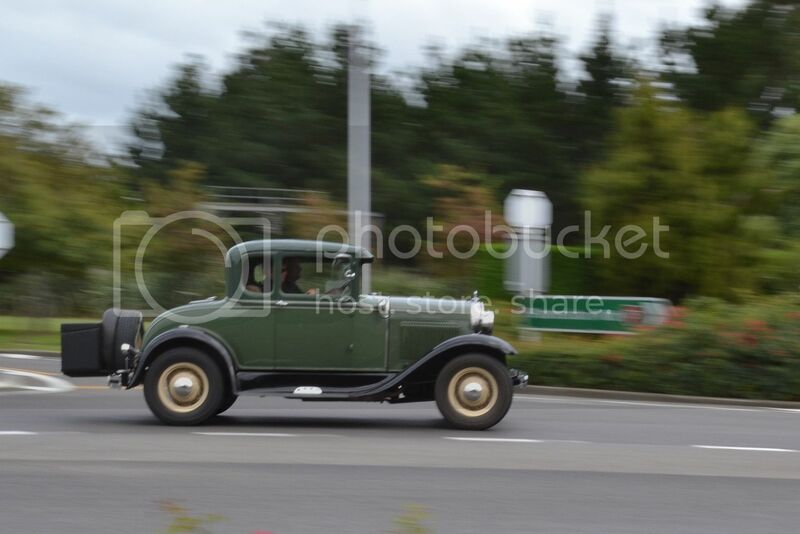 Unfortunately my attempted snap of the Fordor was "bombed" by other traffic. 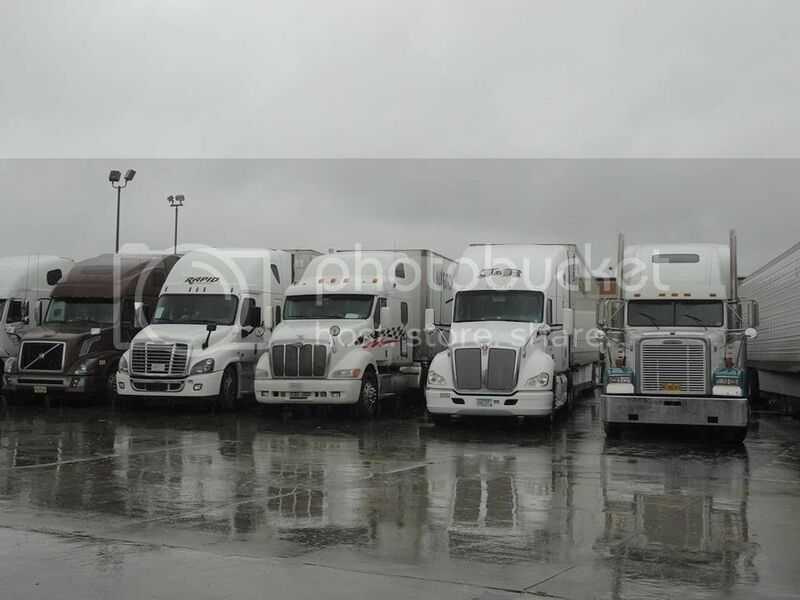 STL Kenworth heads south with a mixed load. 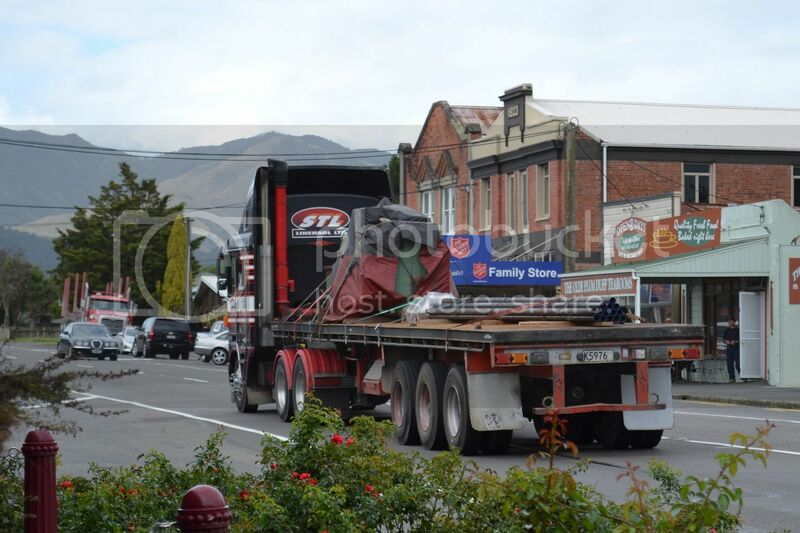 A McCarthy's 2005 Mack Qantum, with over a million kms on the clock, takes the 90 degree turn in Shannon's main Street. 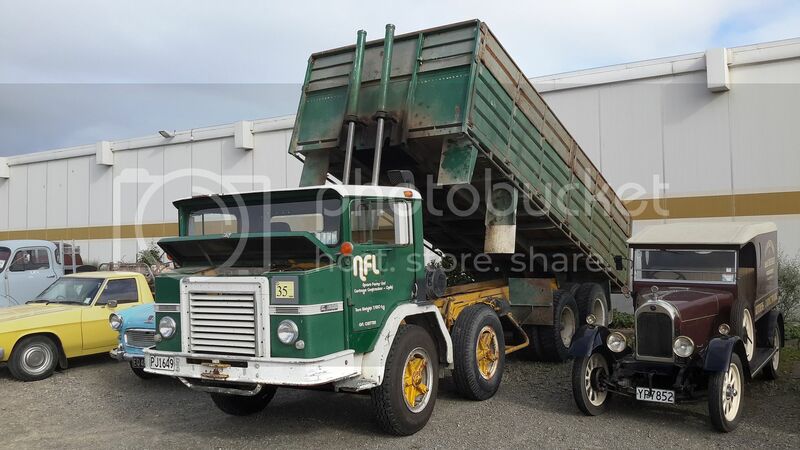 2008 Mack CL688RST of Helenbak Haulage with 40'container on skeletal trailer. The company name makes me wonder just what the owner has experienced. 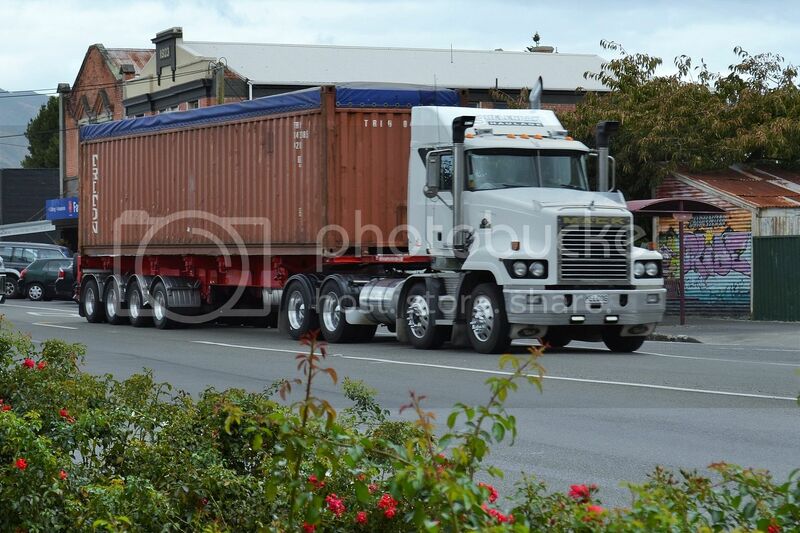 34 tyres to check the pressures of, on this Hall's Western Star 4864FXC of 2014 vintage.. 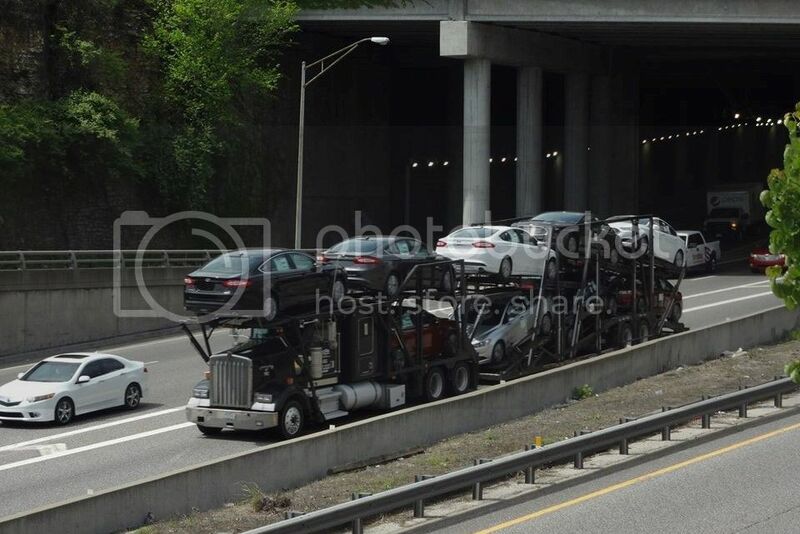 The new FH Volvos appear quite popular. 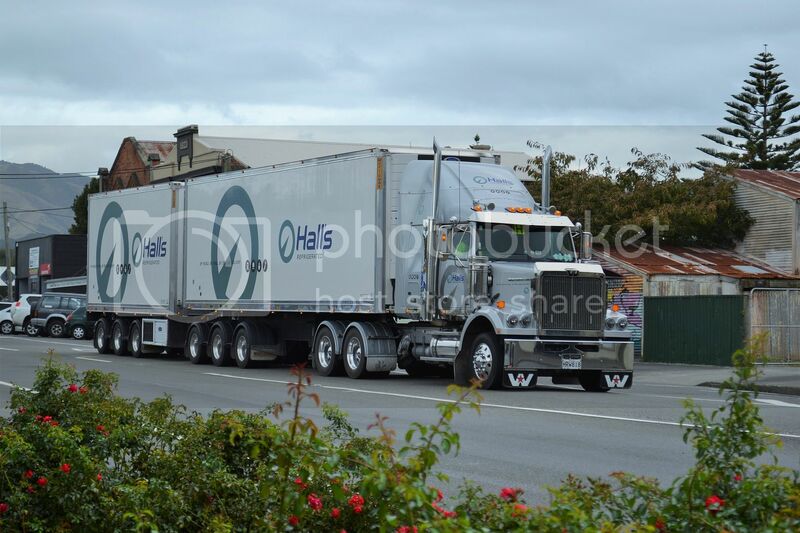 This Truck Rentals FH 540 is a relatively low kms 2014 model. I spotted this well used 1987 BMW R65 among other commuter bikes in the capital, showing obvious signs of being parked in the Wellington weather every day. 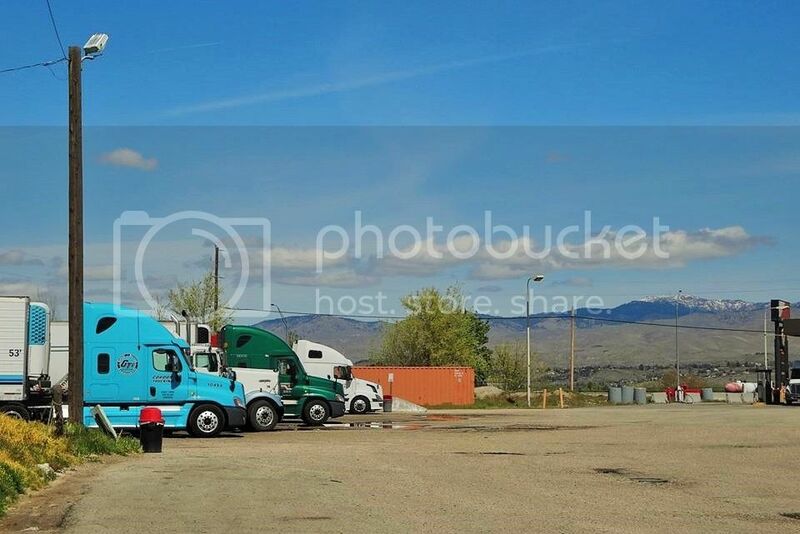 taken at the Flying J Travel Plaza (truck stop/service station) on the corner of Sth Federal Way and Sth Findley Ave.
Peterbilt 579, Volvo VNL, Freightliner Cascadia and Freightliner Century. I'm surprised at the supressed liveries. Most rigs are a single colour with small sign writing and maybe a few stripes. 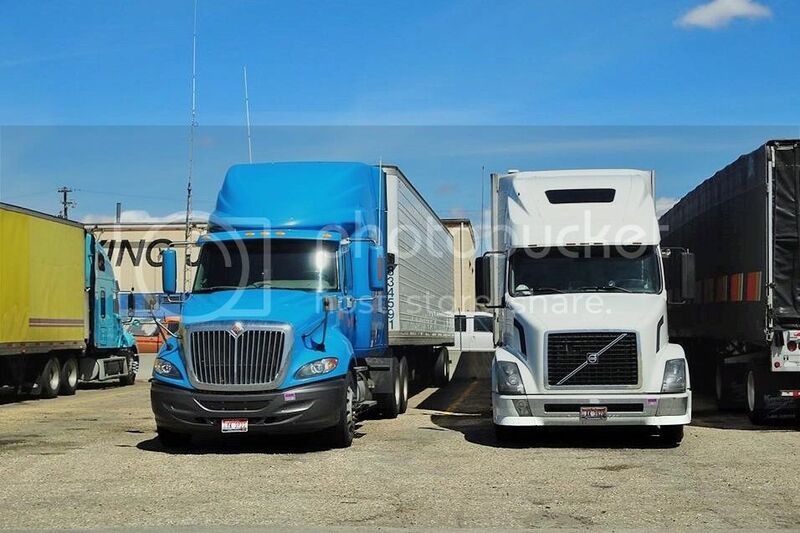 Another Cascadia and Volvo VNL. 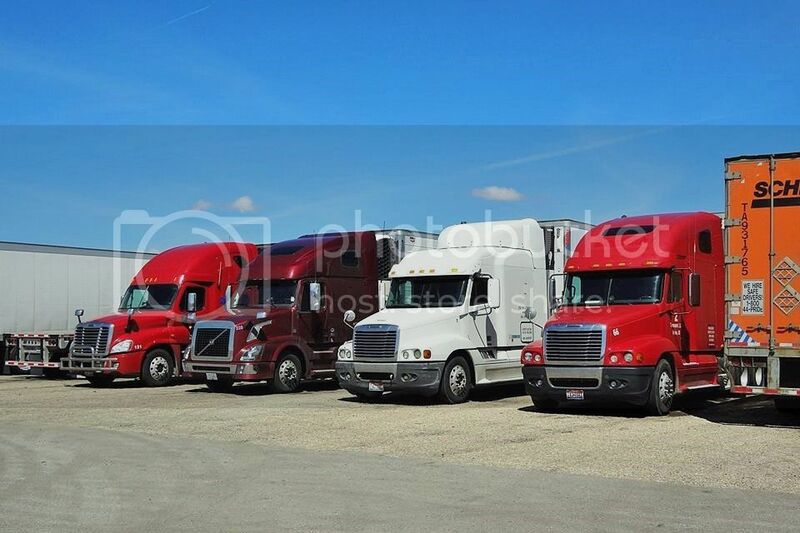 Maroon Volvo is the odd one out among three Freightliners. 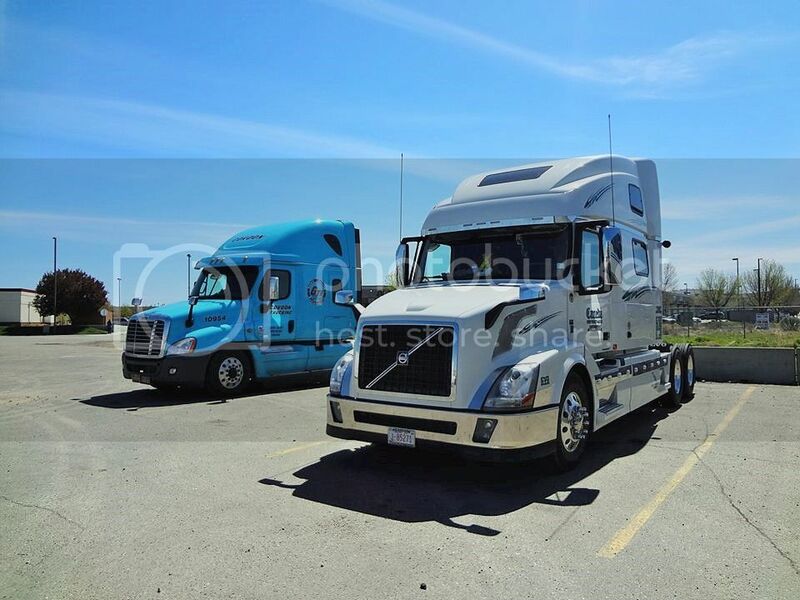 Volvos again, guarding their Kenworth T680 companion. 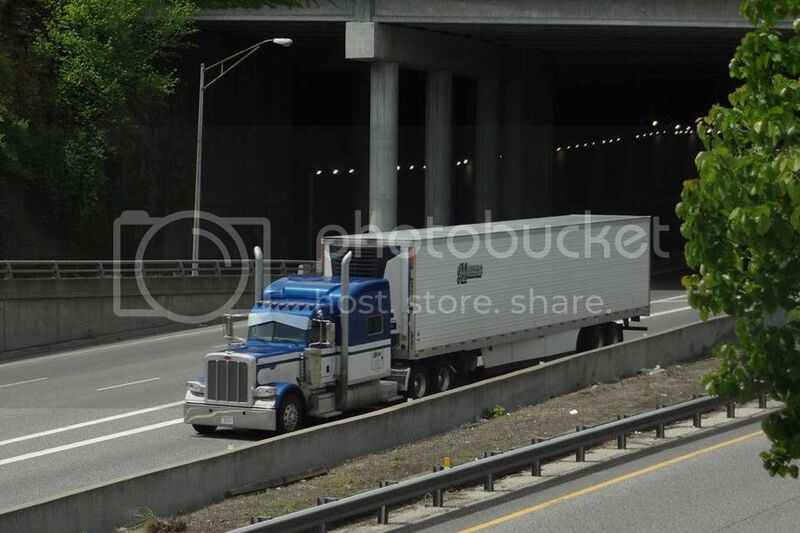 Blunt front of a W900 Kenworth almost looks out of place when surrounded by sloping nose Freightliners. 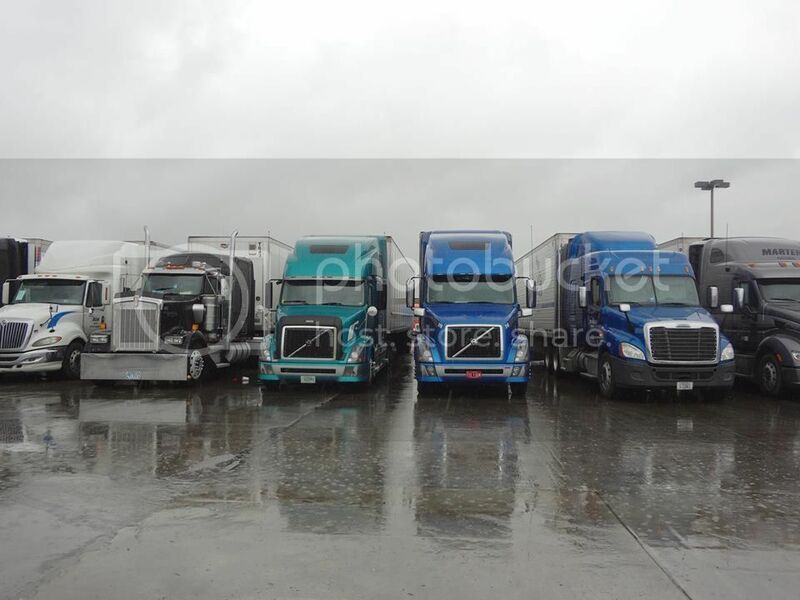 Freighty, Kenworth, Freighty, Volvo. 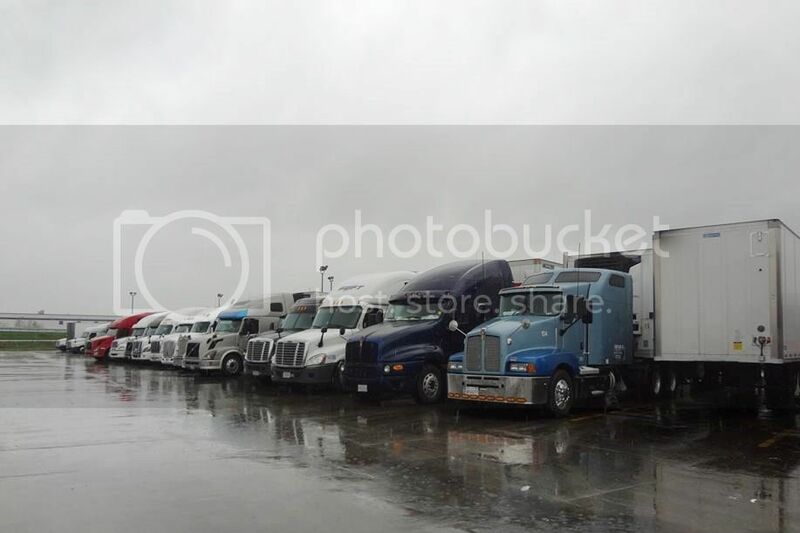 Just a small portion of the trucks in this stop. Blue autumn (fall) skies and a sprinkling of snow on the nearby hills. 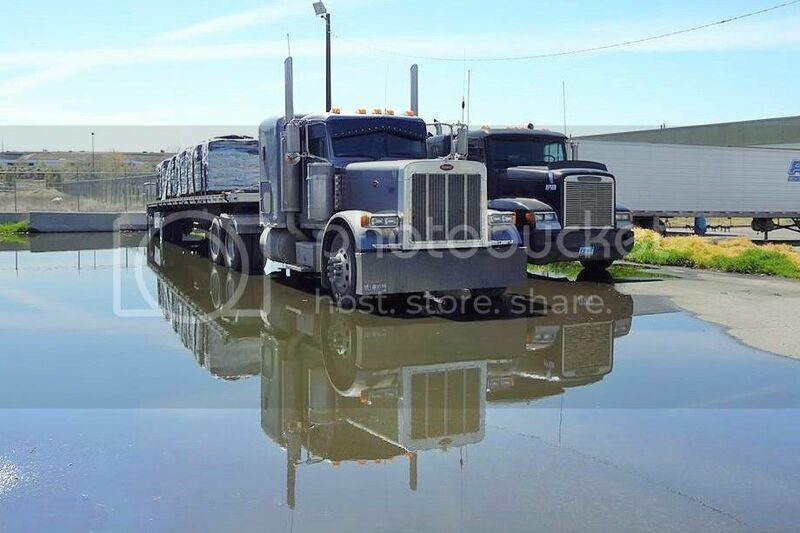 Peterbilt 379 with horrendously long front wheel nut covers, shares a reflective puddle with Freightliner FLD. 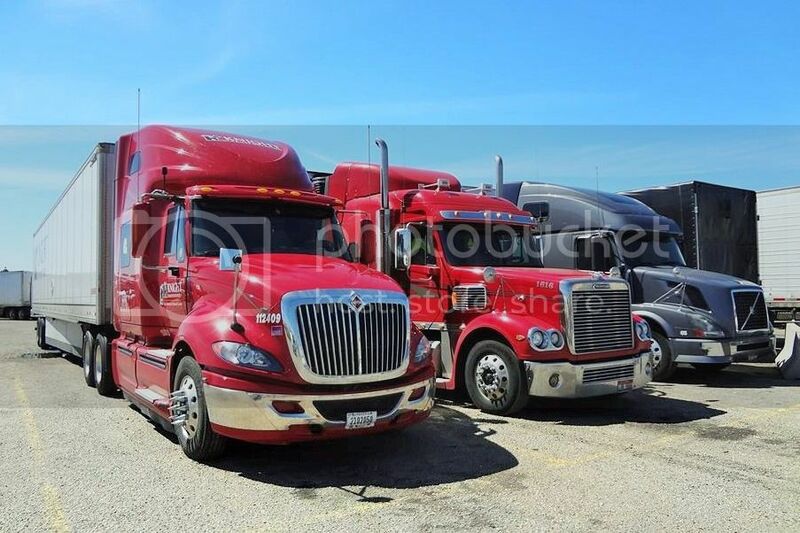 this International Prostar shares space with Freightliner Coronado and a Volvo, once again. Spotted this rig while passing through Greytown today. I originally noticed the raised rear axle on the trailer, but once I stopped to look I realized that the trailer was made entirely of aluminium. As far as I am aware Manac trailers ,as this is branded, are only made in Canada and the US, so it's surprising to see one in NZ. It must be considerably lighter than a steel equivalent, but I would have thought considerably more expensive as well. 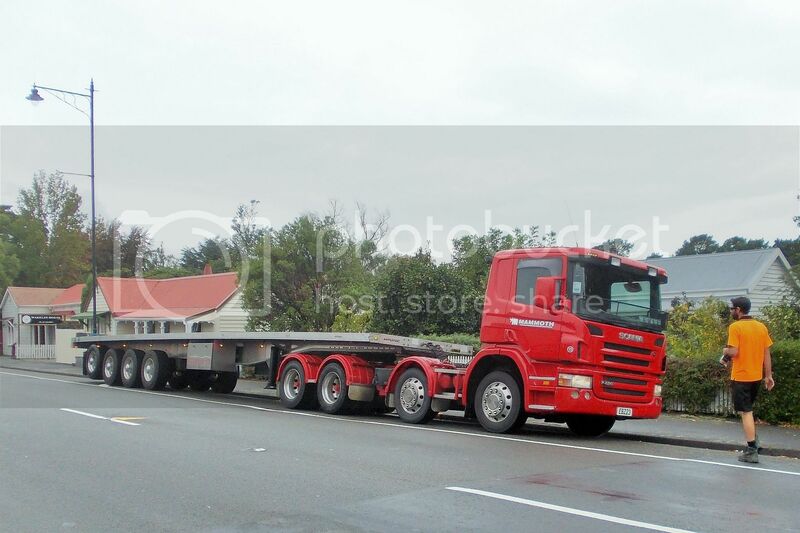 The truck is a 2007 Scania P420. 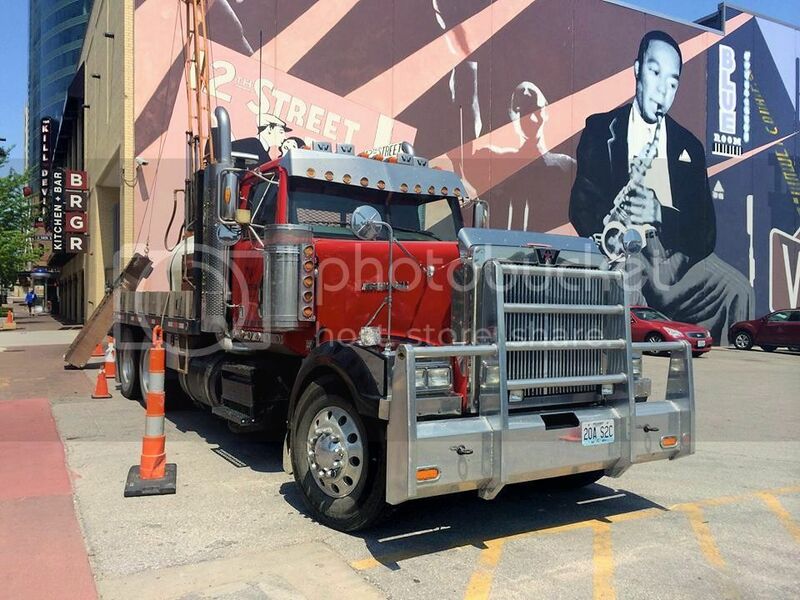 I have noticed in many of Alice's photos (not the truck photos),a tower which seems to be often in the background. I asked Alice about it and she told me it's only a couple of blocks from where she lives and it's huge. She can find her way home with it from anywhere in the city. This picture off Google Street View is taken from some 330 metres away right by Alice's apartment. Alice took this photo a couple of mornings ago, over the neighbouring apartments, with the top disappearing into the clouds. A bit of research reveals that the tower was built for Kansas City Television in 1953 and is a massive 318m tall. In fact the Eiffel Tower is only taller if you measure the antenna on top. It's higher than the top floor of Auckland's Sky Tower. If you are familiar with those aerial masts at Whitireia Park near Titahi Bay, they are only a mere 137m. For the metrically challenged, that 318m equates to 1043 ft. It surprises me they needed to build it so high as the land is very flat in this area. 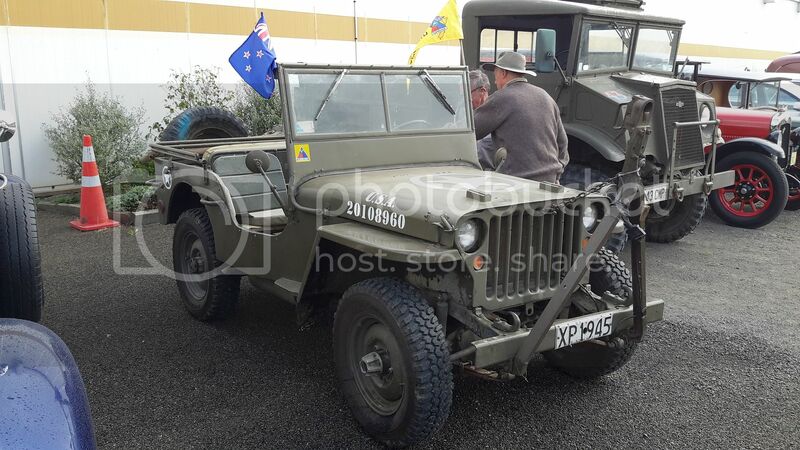 Max has shared a selection of pics of the Vintage Car Club Commercial meet at Feilding, today. 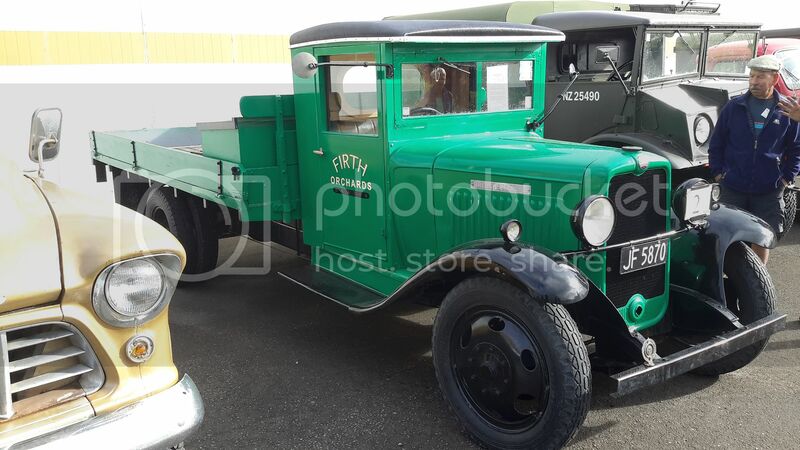 1930 Ford Model A passenger vehicle. A sort of bus with curtains that can be rolled up. 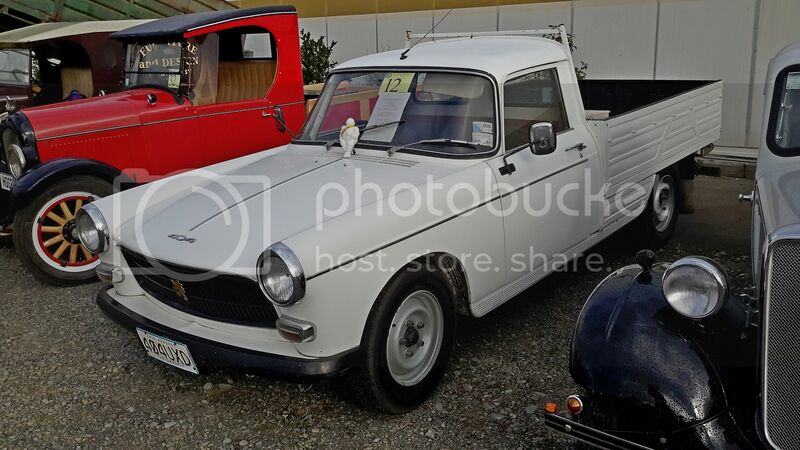 Many years ago I worked for a Peugeot dealer who had one of these as their workshop vehicle. A very useful load carrier with that boxy deck. 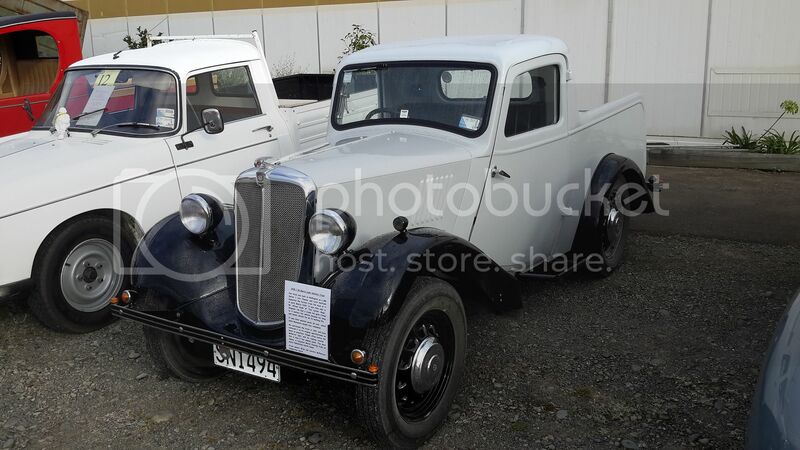 1939 Morris 8 pick-up. My daughter would say "Cute". 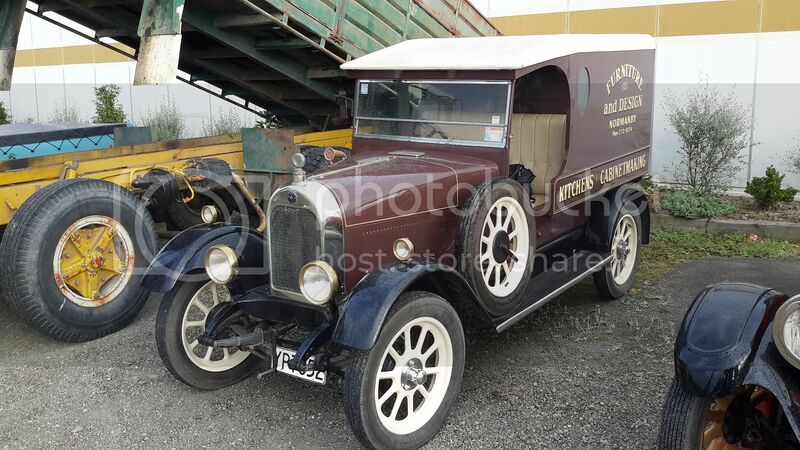 1931 Bedford is similar to a Chev of the same period, but carries the British Bedford badge. 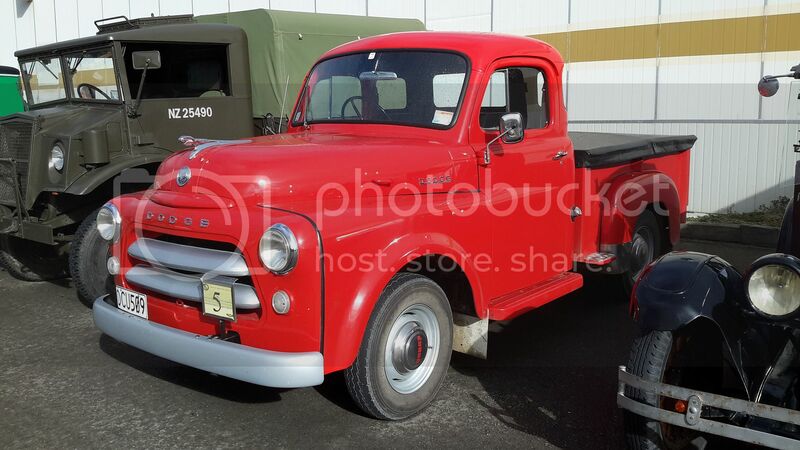 1950s American pick-ups were very stylish. I love the look of this 1954 Dodge. 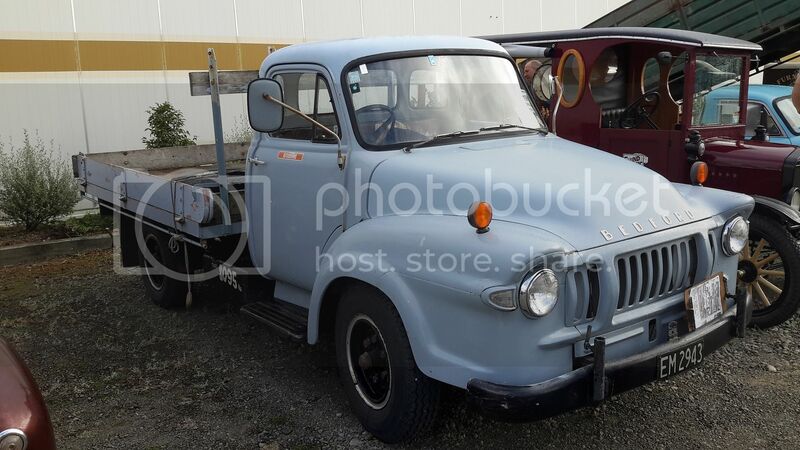 1972 International ACCO 1850 from Inter's Aussie stable. 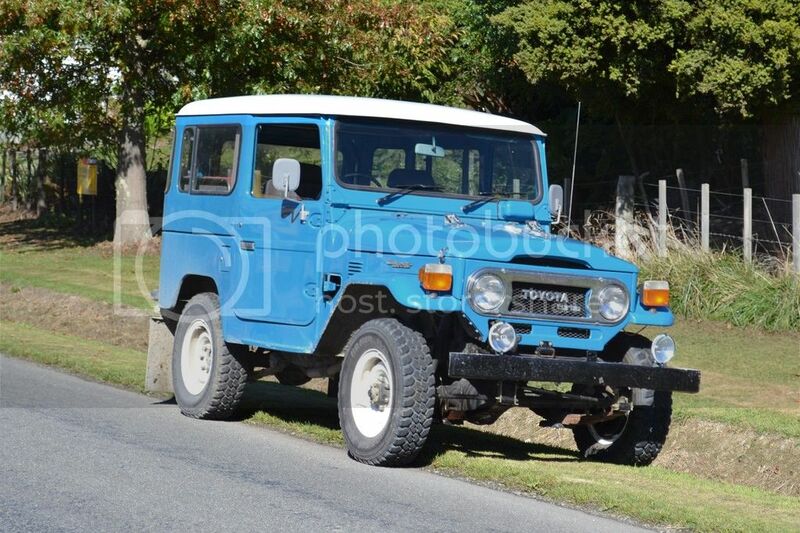 Many of these were petrol powered, but this one is a diesel. 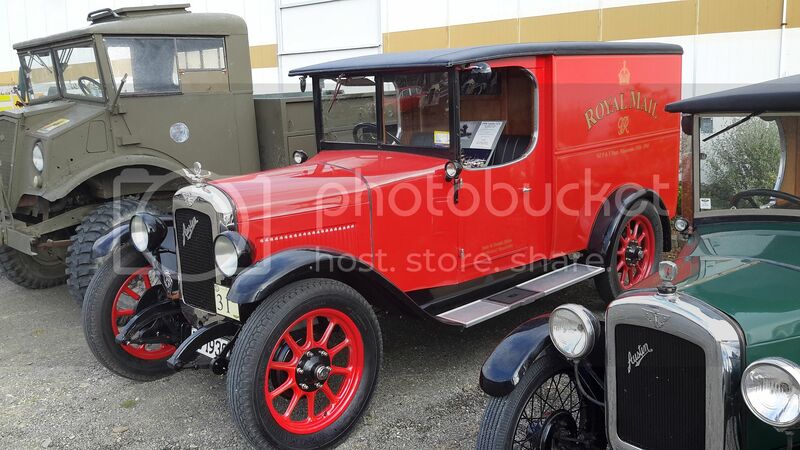 1930 Austin 12/4 in Royal Mail livery, looks to be a meticulous restoration, and I think I see Max's Jag reflected in the windscreen. 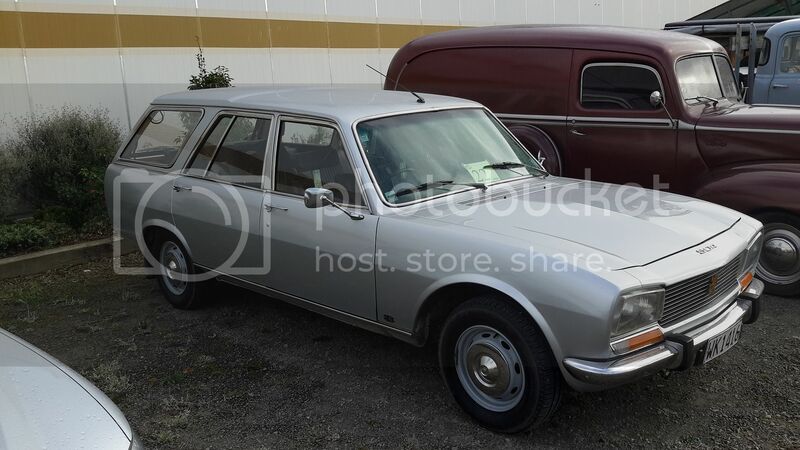 1975 Peugeot 504 Break. The 504 wasn't the most powerful beast, but get one wound up and they can cover the road astonishingly quickly. 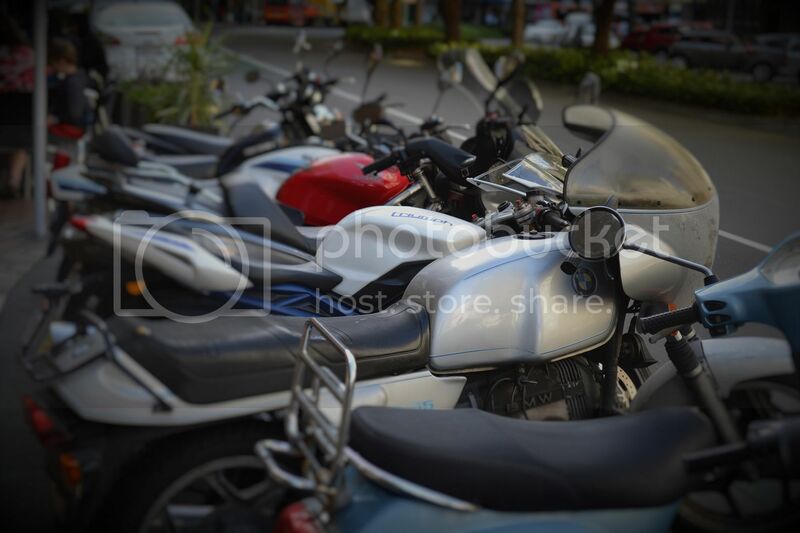 These used to be on the roads in their hundreds. 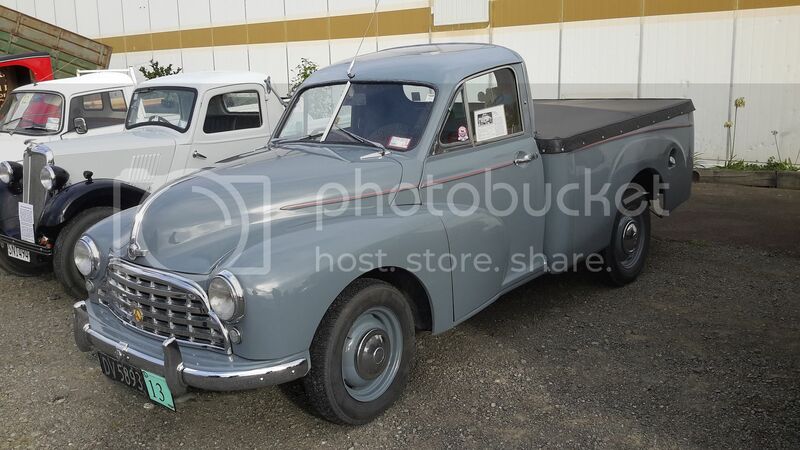 Another vehicle that was fairly common in their day; the 1959 Vanguard pick-up. 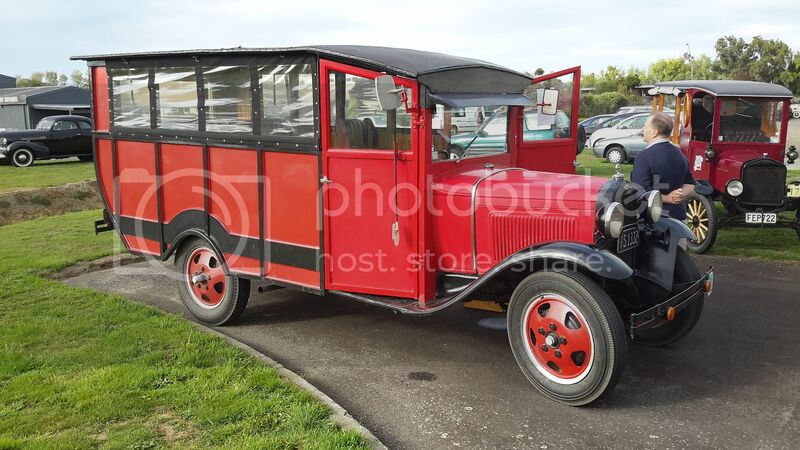 Smart little Morris Cowley van from 1928. Although very simple these have become a valuable item. 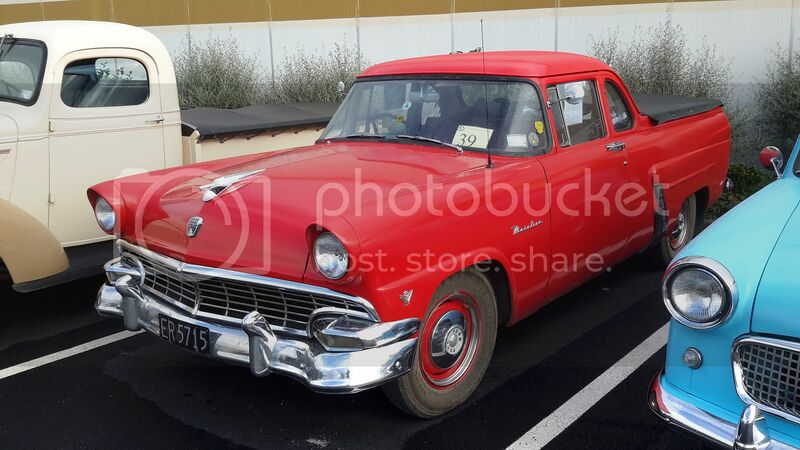 Ford Mainline of 1956 vintage.